Currently, every new space launch leaves two or three fragments of spacecraft in near-Earth space and that can be a rocket stage, an upper stage or detachable fuel tanks—these fragments may circle around Earth for a long period of time, creating problems for space stations and satellites. 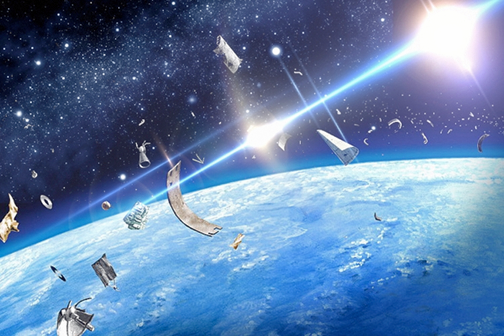 In a news story from Pravda.ru, according to the general director of TsNIIMASH, Oleg Gorshkov, the problem is very serious, as there were as many as 17,800 large objects (larger than ten centimeters) staying in Earth's orbit in the middle of 2016. Russia, the United States and China are the three countries that create most of space garbage, the Izvestia newspaper wrote. "The spacecraft is equipped with ion engines on opposite sides. The satellite approaches a defunct spacecraft and activates the engines on opposite sides. The cleaning spacecraft remains in place while "shooting" a stream from one of the engines to displace the defunct object from orbit. The latter will thus lose its speed and go off orbit," said Gorshkov. According to him, with the engine power of about 5 kW, the time to displace a target satellite will take up to 15 days, depending on the weight and dimensions. Roskosmos was planning to implement the space garbage cleaning project a long time ago. The project, called "Liquidator," was included in the draft Federal Space Program for 2016-2025. Russian scientists are developing a spacecraft weighing four tons that would be able to remove up to 200 defunct satellites from orbit within ten years. The actual implementation remains unknown as of this writing. According to the scientific adviser at the Institute of Space Policy, Ivan Moiseyev, one first needs to agree on an international level as ti who is responsible for space debris and how this responsibility will then be realized. "There is so much garbage in space, and the campaign is to be a large-scale, international event. I believe that in the foreseeable future, one will have to develop joint measures to counter pollution of near-Earth space," he said. For the time being, there are only two countries in the world that have the ability to monitor the level of contamination of outer space—Russia and the United States. It is extremely important to detect space garbage, because unmanaged objects can deviate from their course and get in the way of operating spacecraft. According to experts, defunct space objects precess considerably. Their orbit inclination may change to 30 degrees during a period of 54 years. For example, in early November, several large metal objects fell in the State of Kachin in northern Myanmar. Experts suggested that those were fragments of Chinese rocket Long March 11, which was launched on November 9 from Jiuquan spaceport. Generally, the number of outer orbital debris has taken on truly cosmic proportions. Specialists admit that the number of particles of debris ranging in size from one to ten centimeters may exceed 200,000 pieces, whereas the number of particles smaller than one centimeter may exceed tens of millions of pieces. In 1983, a small grain (less than one millimeter in diameter) left a serious rift in the porthole of a US space shuttle. In July of 1996, a French satellite collided with a fragment of the third stage of the French rocket Ariane at an altitude of about 660 kilometers. In 2001, the International Space Station was lucky to avoid a collision with a 7 kilogram device that had been lost by US astronauts. On March 29, 2006, a breakdown of Express-AM11 satellite occurred after a collision with space debris. As a result of external impact, the liquid loop of the thermal control system was depressurized, the spacecraft received a significant dynamic impulse, lost orientation in space and began spinning uncontrollably. On February 10, 2009, the US commercial Iridium satellite, which was launched in 1997, collided with a Russian military communications satellite Cosmos-2251. The latter was launched in 1993 and decommissioned in 1995.